Provide comfort for the family of Charles Harper, Jr. with a meaningful gesture of sympathy. Charles Haley Harper, Jr., 66, of Cartersville died on December 7, 2018 at his residence. Born in Fitzgerald, Georgia on August 26, 1952 he was the son of the late Charles H. Harper, Sr. and the late Mae Lovett Harper. He was also preceded in death by his sisters, Kathy Harper, and Louise Braswell; and his brother, Cleo Harper. Charles was of the Baptist faith and served his country in the United States Marine Corps. He later became a real estate broker and was the co-owner of H&H Realty in Cartersville. Survivors include his wife, Mary Bess Harper; his children, Leah Harper Bush (Brian), Charles Haley Harper III, and Tyler Lee Harper; his grandchildren, Cole Crump, Griffin Woodall, and Abigayle Harper, and future grandson, Baylor Bush; and his sister, Lisa Evans. Funeral services will be conducted at 12:00 p.m. on Thursday, December 13, 2018 in the chapel of Parnick Jennings Funeral Home and Cremation Services. Burial will follow in Georgia National Cemetery in Canton, for family and close friends only. The family will receive friends from 4:00 p.m. – 8:00 p.m. on Wednesday, December 12, 2018 at the funeral home. Serving as pallbearers will be Calvin Evans, Jerry Thomas, Bill Blair, Cole Crump, Rick Drews, and Mark Harris. In lieu of flowers donations can be made in memory of Charley Harper to the Good Neighbor Homeless Shelter where he served on the Board of Directors and as the Board Treasurer from 2015 to 2017. Donations can be mailed to P.O. Box 664, Cartersville, GA 30120, in memory of Charley Harper. The family would like to extend a special thank you to Dr. Mehta, Alex Tuuk, and the staff of N.W. GA oncology center. Parnick Jennings Funeral Home and Cremation Service is honored to serve the family of Mr. Charles Haley Harper, Jr.; please visit www.parnickjenningsfuneral.com to share memories or to leave a condolence message. To send flowers in memory of Charles Haley Harper, Jr., please visit our Heartfelt Sympathies Store. Joe & Ann Hodges sent flowers to the family of Charles Haley Harper, Jr..
Sending my condolences to the Harper family on the loss of your beloved one. I always enjoyed talking with Charley about his family and many other things. May God's love, comfort, and peace be with each of you in the days ahead. 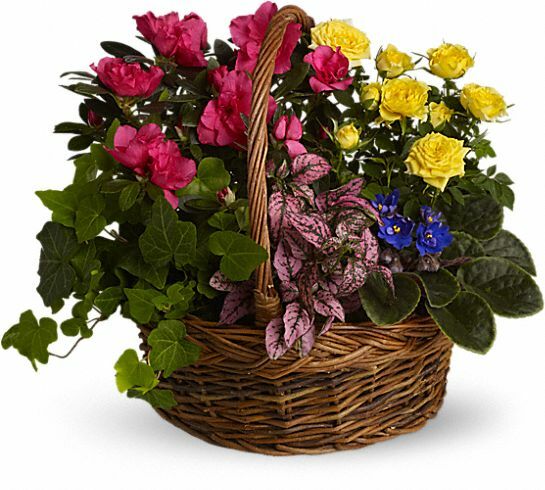 Joe & Ann Hodges purchased the Blooming Garden Basket for the family of Charles Harper, Jr..